Flap Valve Anti Flood Non Return Valve – Freeflush Rainwater Harvesting Ltd. Non Return Valves for drainage and water pipes, available in two sizes 110mm and 160mm. Slips onto the end of pipes. Effective Anti-flood Valve and Rat Barrier Drain Protection. What is a Flap Valve? 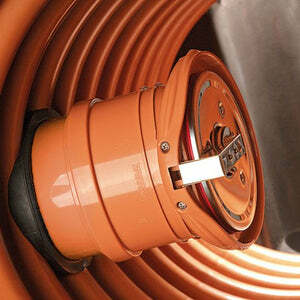 Flap Valves are innovative devices used to prevent flooding caused by the back flow of storm water and sewage. Backflow can be caused by intense rain, thaw or floods. The valves prevent backflow into residential and commercial premises via the drain systems, toilets or sewers. Effectively protecting rooms on lower levels against flooding caused by backflow of storm water and sewerage. Where the Flap Valve has a metal Faceplates (like these), they are also an effective rat barrier to your drainage system. The metal stops the rodents from chewing through the flap facepate of the non return valve and protects your plumbing system from rats and other rodents from entering buildings. Flap Valves are installed on a pipe and allow water (and or solids if a soil or drainage pipe) to flow through the pipe as usual, but prevent anything from flowing back in, like flood water, rats or debris. The pressure of the water flowing through the pipe will open the valve, they automatically close when there is nothing flowing through the pipe. Where Can flap valves be installed? These flap valves are designed to be installed at the end of horizontal sewage pipes entering collection wells, cesspits or on drainage pipes leading storm water to soakaways or rivers. They are sometimes referred to as Outfall Flap Valves. 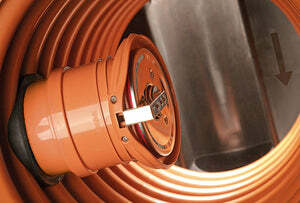 Available to fit either 110mm (4 inch) or 160mm (6") pipes. Easy to install. 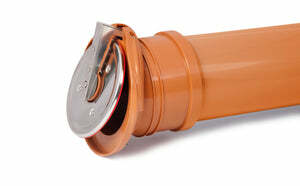 The Non-Return Valve simply slips on to the end of the pipe. 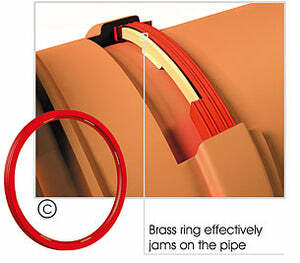 The O-ring within the Valve effectively jams the Flap Valve onto the pipe. This flap valve is equipped with a chromium-nickel cover (A) protecting the flap and gasket. 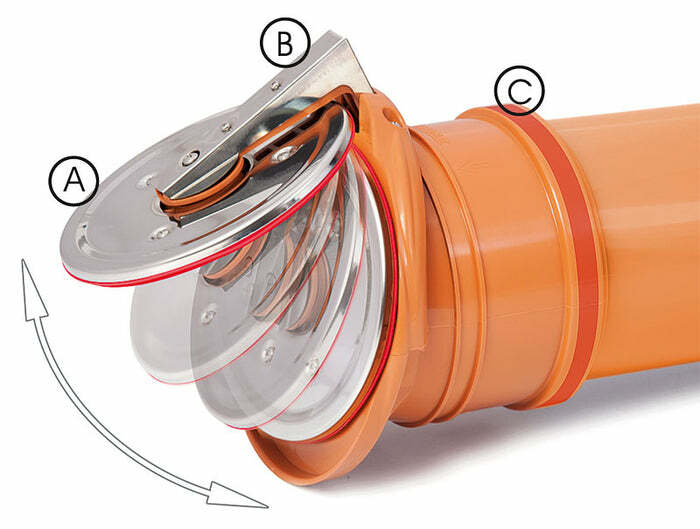 Additionally a chromium-nickel cover of the lever (B) has been designed into the Non-Return Valve to protect against rodents, atmospheric and the environmental conditions (eg. river flow). Flap valves have a rubber O-ring on the inside which ensures a tight fit of the valve to the pipe and effectively keeping the valve in place. Plastic body: high quality polypropylene with increased UV resistance. The material is harmless to the environment and can withstand temperatures up to 95°C as well as resist aggressive chemicals. 110mm and 160mm Inline Backflow Valves for Vertical Pipes.